Unless you’ve been living on another planet, you’ve caught some of the buzz surrounding the long awaited release from Daft Punk. If you’ve missed the free stream on iTunes, Random Access Memories is officially available and you can also listen on Spotify. 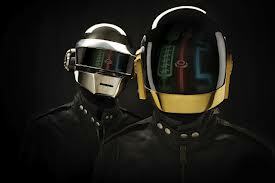 The French electronic dance pop duo fondly known as the robots have once again broken the mold. What makes this record most notable is the interesting choice of A-list musician producer types they tapped to transport them back in time to the 60’s and 70’s to help carry out their mission. The arrival of this record has generated a lot of excitement and we’re right in step. They had us at the very first synth and it completely lives up to the hype. But what’s also newsworthy are these choice nuggets we’ve unearthed on their site: the Collaborator Series video interviews. They play like mini behind the muse documentaries with each collaborator sharing their connection to the men of mystery as well as the little touches of magic that unfolded throughout the creative process. We’ll take any opportunity to explore how music inspires…and this is solid gold. You’ve got Paul Williams taking us back to the crazy days of Phantom of the Paradise and Nile (Chic Le Freak) Rodgers talking about his work with everyone from Bowie to Madonna and once again landing at Electric Lady Studios. The first single to hit the airwaves that plays throughout is “Get Lucky” from rap mogul Pharrell Williams who also shares his own time travel story. Producer and sampler Todd Edwards was so moved by the whole experience that it caused him to actually move….all the way cross country. The overriding sentiment throughout is that these guys wanted to deliver something modern so they looked to the past for inspiration (which is very much in keeping with our own sort of like then but so right now theme). Or as Nile Rodgers beautifully points out it in his segment below, they went back to go forward and in doing so brought something to music that has been lacking for awhile. Ironically, it took a couple of androids to create something organic and bring some soul back to music….and people are feeling it. So even if you’re like Daft who? Punk what?, this is as good a time as any to get on board and into the groove. Helmet sold separately.